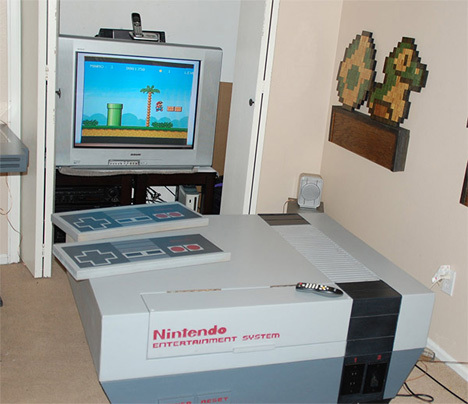 Game rooms deserve the most awesome of furniture. PixelArtStudios makes some of the most seriously fantastic gamer furniture ever. 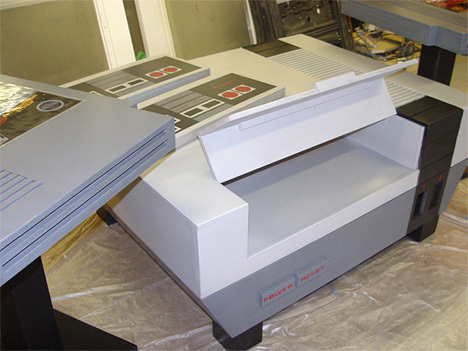 The gigantic NES console is a coffee table with a hinged door that opens up to reveal a compartment. The compartment is the perfect place to put your NES and SNES consoles so you can play all of your retro faves. 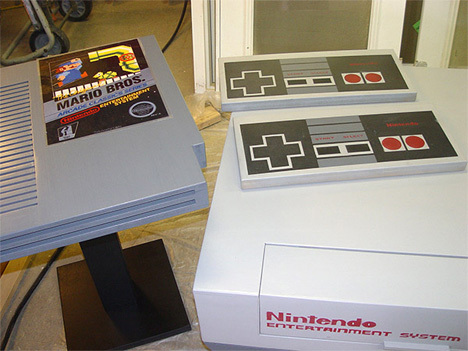 Also part of the set are two huge coasters shaped like NES controllers and two end tables shaped like humongous NES cartridges. A pair of outlets on the coffee table lets you plug your consoles directly into the table. All of the hand-crafted pieces are made of painted wood and make the perfect set for any geek’s gaming space. At $1500 on Etsy, the unusual set is pretty reasonably priced…as far as furniture sets go, anyway. See more in Gaming & Geek or under Gadgets. February, 2013.